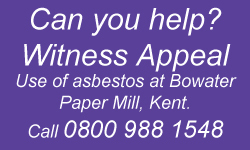 Family of Gravesend pensioner who died from cancer call on former colleagues to help prove asbestos exposure. The family of a pensioner who died from a form of lung cancer is appealing for help to prove he was exposed to a deadly asbestos dust. William Chapman was employed as a stoker in the boiler house at Bowater UK Paper company Limited/ Bowaters UK pulp & paper Mills Ltd in Northfleet, Kent. With the help of Birchall Blackburn Law, which specialises in industrial disease, the family is seeking those who worked with Mr Chapman between 1947- 1974. Witnesses could hold valuable information to help the family secure the financial support they require following his death. The company made white printing paper, brown packaging and corrugated board paper which was distributed throughout Britain, Europe and America. William was a supervisor, in charge of the boiler room and managed a number of staff responsible for shoveling coal into the boilers. William was diagnosed with mesothelioma, an aggressive form cancer associated with exposure to asbestos, in April 2011. 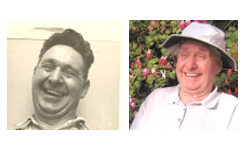 Prior to his illness he was a fit and healthy man who was the main carer for his wife Jessie who suffered from longstanding mobility issues and arthritis. William prepared all meals, helped her in and out of bed, was responsible for all the housework and cared for her at their home in Gravesend. Since his illness deteriorated and subsequent death, his widow, Jessie Chapman was forced to move into a care home. She commented: “Back when William was working at Bowater, he would return home from work covered in fine dust. The first thing he would do was wash his hands and face. He would also have to wash his hair, because it would be completely full of dust and I would have scrub his overalls in the sink. “He would often complain about how dusty and hot the boiler room was but it wasn’t until after his retirement that he started to show ill signs of health. Soon after William’s symptoms progressed, the family insisted Mr Chapman should see his local GP. His grandson, Mark Boston, used to visit the couple throughout the week. He added: “My grandfather was always a fit man and so after a consultation at the hospital he was distressed to hear that he was suffering from lung cancer and it was inoperable. “From April 2012 his condition deteriorated. He was still quite determined to keep going as best he could but was becoming increasingly tired and fatigued. Mesothelioma causes around 2,500 deaths every year, according to the latest Health and Safety Executive (HSE) figures, and the numbers are continuing to rise. According to the Department of Work and Pensions, 53,000 British people will die from mesothelioma between 2013 and 2037. There are limited treatments for mesothelioma because it is a relatively rare cancer and affects mostly people of retirement age, so it is often forgotten and attracts very little research funding. 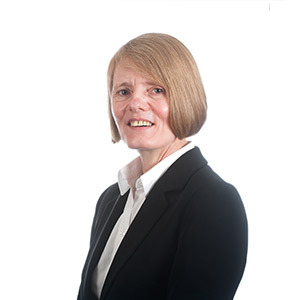 Dianne Yates, partner at Birchall Blackburn Law which is representing the family, said: “William worked hard all his life and was a fit and healthy man. Mesothelioma is a cruel and heart-breaking disease and his death has had a huge impact on the family with Mrs Chapman now in full time care. Anyone with information should contact Dianne Yates or Joanne Keen on Freephone 0800 988 1548. Your details will remain confidential.